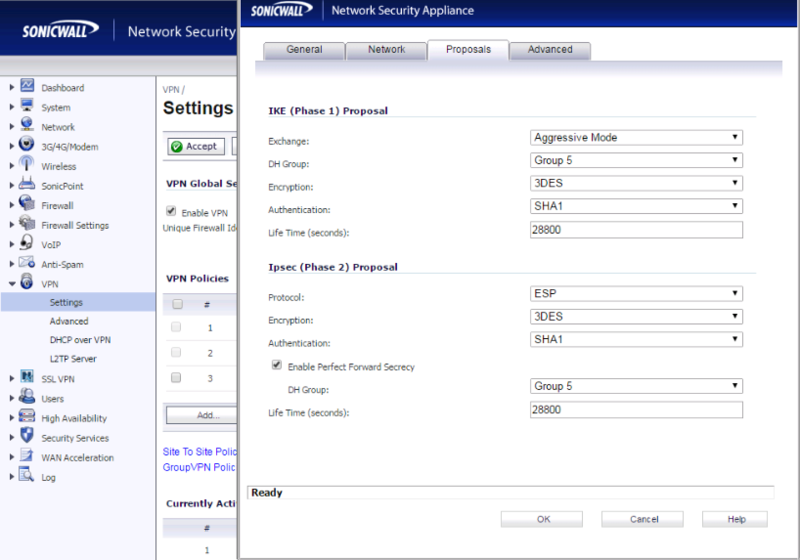 Sonicwall’s are pretty common in my ecosystem. Maybe it’s dell country, maybe it’s just all the small businesses. But Sonicwall is definitely on the windows agenda. There’s the Net-extender app which is supposed to work on linux/unix machines, but I’ve had mixed success. There’s a few open source options out there for ipsec and some come stock on most distributions. A quick search on my redhad/fedora repos gives a healthly list of options. Last metadata expiration check: 1:57:11 ago on Sun Feb 12 08:55:58 2017.
regular net-tools should give us enough to set up an ipsec tunnel, but I found a good amount of info concerning strongSwan and sonicwall so I went for the easier softer route. Besides, I have a real softspot for camelCase. I found a reasonable amount of dated no longer relevant info on the web concerning setting up strongSwan and sonic wall. I just had to hash out what still works and what doesn’t. This post is more of a paste of my configs than anything. I’ll define a few things for you but you’re going to have to do the work here. This setup is for a single client to connect. There’s a few files to touch on with openSwan. It’s no longer one config file. # which IPsec stack to use, "netkey" (the default), "klips" or "mast". # For MacOSX use "bsd"
# Do not enable debug options to debug configuration issues! # natt x509 dpd dns oppo oppoinfo private". 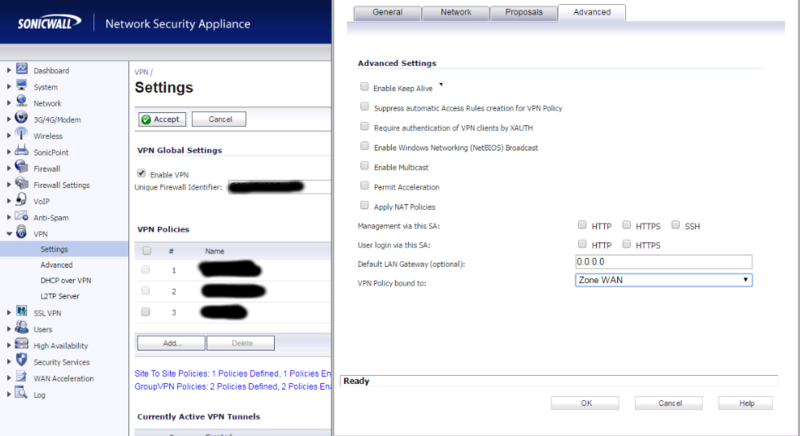 # using 25/8 as "private" address space on their wireless networks. # There is also a lot of information in the manual page, "man ipsec.conf"
<what was in your left=> <what was in your right=> : PSK "<your PSK>"
172.16.5.36 54.99.55.85 : PSK "155D4FFPS658AA8"
On the sonicwall end of things, since you can’t define something directly in your configuration, you have to first create a network object. 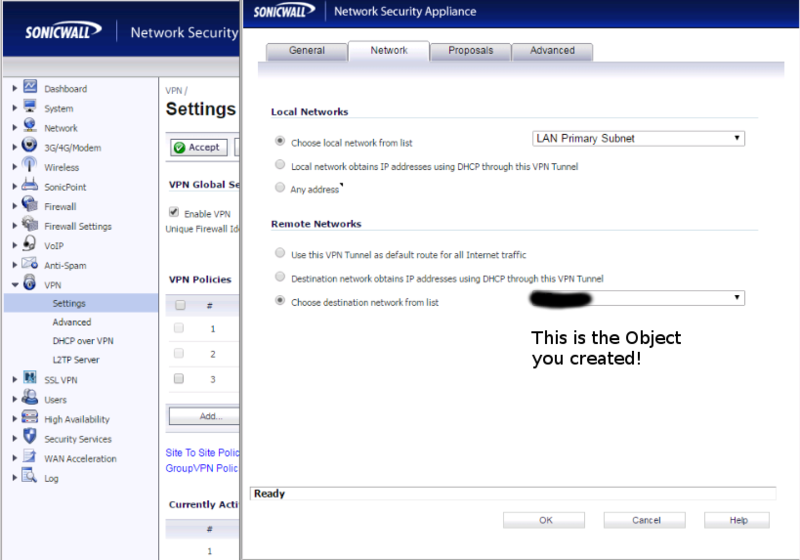 This should be the specific local IP of the connecting host or it’s subnet. We’re going to reference the value of this object in VPN policies. Once you do that, I’ll make things easy for you and give you pictures. 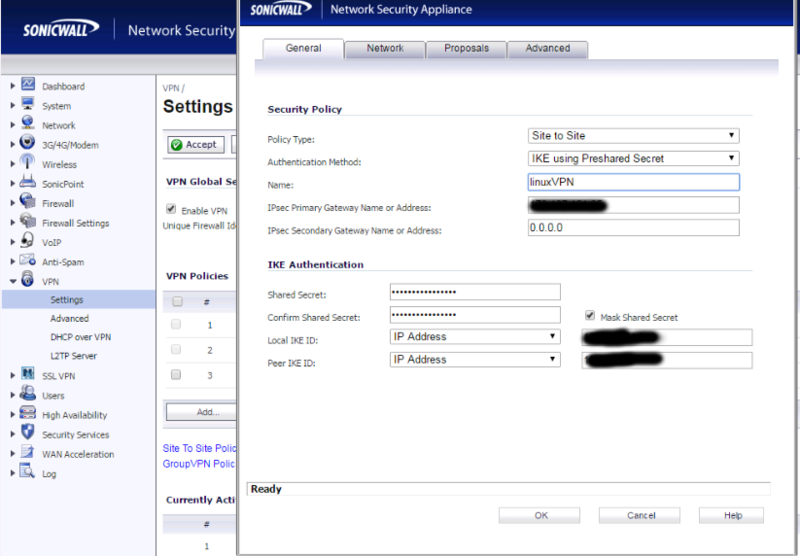 Be sure to match the ipsec policies and protocols used on both ends. I shouldn’t have to tell you this. That should give you everything you need. Stay tuned and I’ll get a cert made for this connection so we can beef this up a little.